Not to be confused with The Devil's Dungeon. The Devil's Tomb is an Eamon adventure written by Jim Jacobson. The Devil's Tomb is the third adventure written by Jim Jacobson, and was first published in 1980. Bearing most of the hallmarks of an early Jacobson adventure, a slightly comical dungeon to explore with random effects, The Devil's Tomb is one of the most frequently ported Eamon adventures, appearing as part of Michael Detlefsen's Atari ST port of Eamon under the name The Goblin's Tomb. 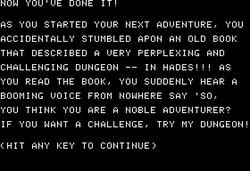 In the Main Hall a book describes a dungeon in Hades, however when it is read a mysterious voice (presumably the titular "Devil"), offers the chance for the adventurer to try the dungeon for him- or herself, whereupon he/she is magically transported to a dungeon cell in Hades. From there the adventurer must fight their way out, picking up treasure and contending with odd magic, random monsters and strange challenges along the way. This isn't really all that difficult of an outing, except that there are one or two puzzles that will surely try your puzzling skills as well as your patience! First, the hints, for those of you who want to try this on your own. These are largely repeats of the hints listed in the review: You must often type in full commands with no abbreviations. However, when working with doors, use the object name DOOR instead of the door’s listed name. The first door can't be opened, but there are two standard commands that will get you out. The second door can only be opened, but it takes all of your strength to do so, even that strength you are using to carry your stuff. Well, let's get started! This time out, we'll take the scenic route and hit almost all of the rooms. I will say to kill most of the denizens you see, but there is a chance that some might be friendly, so you might want to test them before attacking. As the adventure opens, you find yourself trapped in a cell in the Devil's Tomb. Obviously, your objective is to find your way out, and maybe pick up a little treasure along the way. First off, let's check the command list. Our new commands are BET, OPEN, and READ. Given the age and level of this Eamon, odds are good that the new commands are special purpose and not general-use. Go S into the torture chamber, then W into a cell, and get the diamond ring. Return E. Continue E into another cell. There's nothing here, so return W.
Head S to a T-intersection. Turn E, and kill the zombie. Continue E and kill the lizard. Let's look up those stairs: go N three times to a platform and look around. There's nothing here, so return S three times. Go E into a cell with shiny blue walls. Read the word NEAMO on the floor. If you SAY NEAMO, you will be randomly transported elsewhere in the dungeon. We don't really need to do that, so return W three times to the first T-intersection. Go W four times. Get the painting and vase along the way if you wish. There's nothing here, so return E. Turn S to a corridor with a hole in the west wall. Get the bow. Go W through the hole and kill the torturer. Go UP the ladder into a huge cavern. A book! Get the book and read it, and learn the spell TREZORE. (TREZORE is a very powerful spell that is very similar to POWER. It carries the chance of great reward as well as great danger. It looked to me like the odds may favor a harmful result. TREZORE is not needed, but it has a lot of interesting results. Use it at your pleasure and your peril.) Go S to a 4-way intersection. Continue S into a cell. There’s nothing here either, so return N.
Head W and get the ruby. Go N and kill the wildman. There’s nothing else here, so return S and E. Go E down the tunnel. Kill the Blob, then continue E to a T-intersection. Go N—we've been here before, so return S.
Go E to the bend. Read the inscription—hmm, apparently we can’t read inscriptions. Go N into a cell and kill the infant. Get the old book. Sheesh, this can’t be read either. There’s nothing else here, so return S.
Continue S, then E, then S again. Go S into another cell. Open the box of TNT and find it's empty. Return N. Go W into another cell and pick up the sling, then return E. Go E down the corridor and find a golden apple. The apple is a trap that explodes when you pick it up, but the damage is minimal, and you do get to keep the apple. Continue E to the end of a long hallway. Notice that south wall? Don’t do a LOOK yet; we’ll be back shortly to check that out. For now, head N up the corridor. Kill the tiger. Go W into a fancy room, find nothing, and return E.
Go E into the casino, and find a scroll. Get the scroll. It will crumble to dust if you try to read it. You can BET on the Wheel of Fortune if you wish. This is a very high-stakes game! You bet points of your hardiness, agility, or charisma, and you might die if you get a bad spin. Return W and go N, then N again to find a dead end. Get the necklace, then return S three times to that wall we noticed. Go N into a small chamber, and kill the witch doctor. Get the shield and the gold spear, then return S. Continue S into another small chamber. Open the chest, and get all. Return N then W.
Continue W, then S to an arch. It says ABANDON HOPE ALL YE WHO ENTER HERE. Well, that sounds both promising and dangerous. Let's check it out! Go S through the arch. The Devil's Temple! Yow, there sure are a bunch of bad guys. Fortunately, they are rather cowardly. Clean them out. There are exits in all directions, but I'll save you a little aggravation right now and tell you that all of the exits are death traps, except for the way you came in, and the iron door. That big bolted iron door looks interesting. OPEN doesn't work. POWER doesn't work. TREZORE doesn't work. There's only one way to get it open. DROP ALL, then OPEN DOOR. Pretty obscure, I have to say. OK, it's open. GET ALL of your stuff, and go W through the door. You're out! Sell your loot, and head home. The Eamon Deluxe conversion, as with others of The Jim Jacobson Adventures Deluxe, adds some extra specials and challenges to the game. It also adds the ability to meet former characters from previously played Jim Jacobson adventures, as well as simplifying some of the puzzles, albeit that unlike in The Cave of the Mind no extra rooms have been added. If you departed The Zyphur Riverventure with the Gold Warrior as a friend, he will appear at the beginning of the adventure to break down the cell door. You will also encounter A.J. in one of the other torture cells confessing that he also got tricked into the dungeon through reading the book. If you defeated him on the Zyphur River, the Black Warrior is back for revenge just up the ladder near the Trezore book, and he continues his rivalry with the Gold Warrior seen in the previous adventure. The zombie is always friendly in the Eamon Deluxe version, described as "an amnesiac zombie"; however, there is a chance that he will remember who he is, and if he does so he'll instantly become hostile. Various other characters have been added, including a large number of extra gamblers in the casino. You can also now read or examine many more objects, for instance the inscription above the cell where the mutant baby lies now reads "day care center", and examining the window of the cell where the wild man is confined shows a view of a lake of fire. It is no longer necessary to drop all your equipment to open the bolted iron door; instead, simply use the box of TNT on it. Tom Zuchowski Awarded the adventure a 4 of 10, and cited it as a particularly hard play. He also was slightly displeased at some of the programming inequities that occurred due to the early version of the Eamon program used in the adventure, such as the need to use the full name of objects such as doors. Luke Hewitt awarded the Eamon Deluxe version a 6, enjoying the setting though noting it was a more traditional dungeon than previous Jim Jacobson adventures. The spell Trezore is another reference to the powerful wizard who appears in The Quest for Trezore. In the Eamon Deluxe version of this adventure A.J. returns one final time in The Abductor's Quarters. It is obvious from the use of demons, torture devices and the appearance of tridents and other symbolic artifacts that that Jim Jacobson obviously meant this adventure to be set in Hell rather than the underworld of Greek mythology. It is possible he made the name change to avoid giving offence to certain Christian players, much as was done in the seventh Fighting Fantasy Gamebook Steve Jackson's House of Hell which was released as House of Hades in the United States. This adventure was the first both to let the player alter their Hardiness, Agility and Charisma by betting in the Casino, and to feature trap items that damaged the player when drunk or wielded. Frank Black actually recommends using such trap items to the player's advantage in the Eamon Deluxe conversion since they can be given to unfriendly monsters who will try to either drink or wield them. This page was last edited on 23 April 2019, at 06:33.